Historic Christ Church, 5 Paterson St., New Brunswick, will be holding three noteworthy music programs in the coming weeks. The first is a presentation at 9:30 a.m. Saturday on psalm singing, accompanying, and improvisation as they are practiced in the Netherlands. The demonstration will led by retired Professor Thomas Spacht of Baltimore's Towson University. Prof. Spacht and the choir will then perform the second program this Sunday, as part of the regular Evensong and Organ Recital at 4 p.m. The choir and organist Thomas Spacht will perform Johan Bernhard Bach's Ciacona in B-flat, Psalm 91 of Klaas Bolt, Psalms 116 and 138 of Margaretha Christina de Jong, Psalm 42 of Sietze de Vries and "Jauchz, Erd', und Himmel, juble!" of Max Reger. The third is a Jazz Vespers at 4 p.m. Sunday, Nov. 1 in honor of All Saints' Day. Mack Brandon, Benny Barksdale and an ensemble will perform. For more information on these programs, visit the church's website. On Wednesday, Oct. 21, at 8 p.m., guitarist Dr. Stanley Alexandrowicz will be performing at Goucher College in Baltimore with members of the Music Department Faculty in a program dedicated to the 80th birthday celebration of Czech composer Vaclav Kucera. On the program will also be a world premiere of mine, a fantasy for solo guitar called In Perilous Seas that Stanley commissioned from me last year. Stanley is a great performer, a former student of Manuel Barrueco, a graduate of Manhattan School of Music and an Albany recording artist. 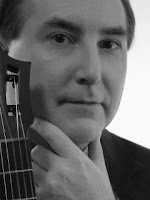 I've known him since the mid-80s and he has always been a relentless explorer of the guitar literature, turning up scores and composers that have, in turn, become major influences on me and others of his contemporaries. Kucera is a great example. A remarkably original and inspired composer, he is not well known in this country and I would know nothing of him were it not for Stanley's research. Of Kucera's works, the birthday program will present a U.S. premiere, with a string orchestra conducted by Goucher's ensembles director Elisa Koehler, of the Concierto Imaginativo „Homenaje a Salvador Dalí” and the Maryland premiere of his solo Diario: Omaggio a Che Guevara. The program will also include work by Ernst Bacon, Brian Fenelly and Eric Sessler. Stanley will be repeating elements of this program at the Composers Voice concert Nov. 29 at the Jan Hus Church in New York in the last week of November and I'll post information on that concert as it approaches. Just received an email from Opera New Jersey announcing that Scott Altman has accepted a position as General Director of the Arizona Opera and he and his wife Lisa Altman are stepping down as directors of the company they founded in 2002. Based in Princeton, OperaNJ has grown enormously in that time and is one of the leading operatic companies in the state, offering many performances by young operatic stars in many venues in many towns through New Jersey. The pair will continue to work with OperaNJ through the end of the calendar year to ensure a smooth transition, and the group plans to continue its 2009-10 season as scheduled. In addition to the two events I mentioned in my last post, this Sunday, Oct. 18, has a few more tricks up its sleeve. Cellist Sofia Nowik performs a solo concert at the Music at Saint Mary's series at 4 p.m. Nowik is a Juilliard Student and already a nationally known performer. The church is located 256 Augusta St., South Amboy. For more information, check out the MASM's website, www.musicatstmarys.org. At St. James Church, 300 Broadway, Long Branch, organist Tom Colao offers a solo program of two pieces each by master composers and organists J.S. Bach, Maurice Durufle and Cesar Francik at 4:30 p.m. The pairs represent contrasts within each performer's style. The Bach selections, are the "St. Anne" Prelude and Fugue, and the E-flat major Trio Sonata. From Maurice Duruflé there will be the Scherzo op. 9 and Chorale variations on "Veni creator Spiritus " The César Franck selections are Pastorale and Choral in A minor. The organ is a 3-manual French style instrument originally built in the 19th Century. Tickets are not required. Donations will be collected at the door. For more information call 732- 222-1411 or visit www.stjames-longbranch.org. Retired clergy member and brass band enthusiast Jacob Hohn writes "the Montclair music forces of The Salvation Army will be at The Salvation Army, Asbury Park, for a free concert" at 7 p.m. Hohn continues: "This brass band is considered one of the finest in the Eastern USA. Some of its players are internationally known in brass band circles. The bandmaster is Charles Baker, the principle trombonist with the NJ. Symphony." The Asbury Park Salvation Army is located at 605 Asbury Ave., Asbury Park. The phone number is (732) 775-8698. This coming Sunday, Oct. 18, appears to be the most popular day of the year to hold a concert. As I've mentioned, the Monmouth Symphony Orchestra will be performing at the Count Basie Theatre, 99 Monmouth St., Red Bank at 3 p.m. A pre-concert talk will begin at 2:15. I will be there for that concert as my orchestral prelude, Certain Dark Things is on the program. Roy Gussman conducts and the MSO Concerto Competition winner, Suejin Jung, will be the soloist in Beethoven's Piano Concerto No. 3. I was one of the judges on the panel that selected Suejin, so I can attest to her capability. She's an extraordinary player. Also on the program will be Mussorgsky's Pictures at an Exhibition, a work that was a huge inspiration to me as a young man. While it seems like this concert was framed around me, the opposite is actually the case: Pictures and the concerto winner were scheduled before my piece was added. My connection to the other two works is a pure coincidence. More information is available on the website, www.monmouthsymphony.org. Tickets are $30, $25 for seniors and $5 for school-aged children, available by calling the Count Basie Theatre box office at 732-842-9000. If you're not interested in joining me at the Count Basie, you can take your family to the Algonquin Arts Theatre performance of The Jungle Book, also starting at 3 p.m. Produced by The Magik Theatre (refer to Hesse's Steppenwolf to understand why that's a weird handle for a children's musicals production team), the show is 60 minutes long and "perfect for children of all ages". The Jungle Book story by Kipling is a more harsh and deeply entertaining story than is told by Disney, but I suspect this production will rely on the more popular version. Tickets are $12 for children and $15 for adults, seniors, and students. To reserve seats or obtain more information, contact the box office at 732-528-9211, boxoffice@algonquinarts.org or visit the website, www.algonquinarts.org. Algonquin Arts is located at 173 Main Street in downtown Manasquan. And there's more! But I have to get ready for class and I'll post those later. I've had a number of obstacles to posting lately, including the beginning of the school semester. So I'll be spending the next few days getting caught up with the flood of concert announcements that have been coming in. I'm trying to persuade the Asbury Park Press to host this blog and pay me for it, as they do with staffers (I'm a freelancer for them). They've offered to reprint it, which I politely refused since that would split the audience for the blog even further. At the moment, many of my readers who comment on the reprint on Facebook never register as followers on Blogger, where the blog is actually located. So from a purely statistical point of view, they don't count. I'd be interested in hearing from others in a similar situation, trying to wrestle the new media into something more businesslike. As I mentioned in my Asbury Park Press column two weeks ago, Mussorgsky's "Pictures at an Exhibition" was one of the pieces that served as an entry for me into the world of classical music. I had heard Emerson, Lake and Palmer's version and liked it a lot. As a teenager, I saw the group perform at the Pittsburgh Civic Arena--in the style of concerts at the time, those were more or less spectaculars, almost like Broadway productions in scope. A professor of mine, referring to a Genesis concert he attended, said it confirmed his notion that they should be called "shows" and not "concerts." He was absolutely right. The ELP performances in particular involved a lot of lighting and visual special effects, a lot of theatrical antics, particularly by keyboardist Keith Emerson. But as much as I liked the band's shows, the real experience for me came from its recordings. I liked the luxury that records provided of getting to know music in detail, to the point where a few seconds of a simple timbre could tell me exactly what part of what recording I was hearing. ELP's music in particular offered a lot of opportunity for discovery, not the least because their music was often drawn directly from classical sources. Sometimes that connection was overt, as in the band's performance of Aaron Copland's "Hoedown" and Mussorgsky's "Pictures." And sometimes it was hidden, as in the band's arrangement of "The Barbarian" by Bela Bartok (not credited on the album) or in their original compositions like "Take a Pebble" that drew on classical models. After finding the Mussorgsky score for piano solo in a practice room bench, I worked hard, very hard, and ultimately taught myself to slog through the three opening movements "Promenade"," The Gnomes" and a reprise of the "Promenade." It would have been no great thing to master a few of the other movements, but my teacher didn't insist and, being a kind of lazy teenager, I never did. Building on my interest in "Pictures", my teacher handed me some Beethoven Country Dances and a couple easier sonata movements, Bartok's "The Barbarian," Debussy's "The Golliwog's Cakewalk," Chopin's preludes and Bach's two-part inventions. I was astonished that the Bartok was the same piece that appeared on the ELP album and I dove into it with all my heart. The "Golliwog" I came to love, with its ragtime references and comic timing. The Chopin and Bach I've never stopped exploring--a copy of both sets has been on or near my piano ever since, and led me directly to the Chopin Etudes and the Bach "Well-Tempered Clavier." Before I knew it I was in a deep world with wild-haired composers and glorious and strange musical styles sprouting up all around me. Mind you, if my teacher's goal was to keep me excited, she made some serious missteps. I never did master a Clementi Sonatina--I considered it too much like boring beginner's music and just wasn't interested. I was wrong about that, as it turns out. The Clementi Sonatinas are interesting, even if they're not very rockin'. But the style was too reserved for me as a teenager. It's interesting, in that respect, that she didn't give me some of the more characteristic Beethoven sonatas with their drama and passion, or push me to learn the Rachmaninoff Prelude in G-sharp minor that she knew I loved so much. Those are the mistakes teachers make. In my case, I can't really call them mistakes, in fact. I was a difficult student and by and large, she did well, more or less single-handedly turning me into a pianist. So these are just questions that continue to inform my own teaching and the exploration of music. It is kind of nicely symbolic that I never learned "Pictures" completely. That piece opened a door--I walked through and found myself on a long journey. And I am not even close to being done.